Long ago, Centurion and the Raven were simultaneously exposed to the Human Duplicator’s Doppelganger-Ray Gun. The result was the super-powerful being known as the Amalgam. With the powers of Centurion and the cunning of the Raven, the Amalgam suffers bouts of dim-witted confusion that make him one of the most dangerous beings on the planet. 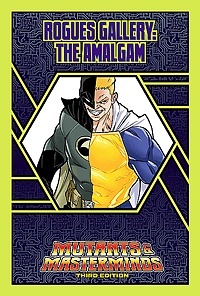 Get the Amalgam today—just $1.95! Rogues Gallery: The Waxman (PDF) Ronin Round Table: What is Best in Life?